Bushnell 781700 Discoverer 15-60x60 Spotting Scope 781700 FREE SHIPPING! The Bushnell Discoverer 15-60x60 is a variable power, long-distance in-line spotting scope. 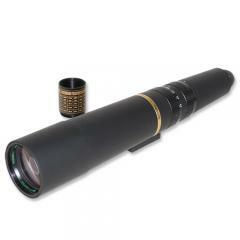 It can be adapted for use with a 35 millimeter camera using the included adapter, making it an essential tool for long-range surveillance and evidence gathering. Its multi-coated optics maximize light transmission to provide superior brightness and image quality, so small details don't blur into the background. The generous field of view makes it easy to survey your surroundings and track moving targets, with high resolution all the way to the edges. Its rubberized surface provides a non-slip grip for secure handheld use. ©2002-2019 CopsPlus.com: Bushnell 781700 Discoverer 15-60x60 Spotting Scope 781700 FREE SHIPPING!